New SkyDrive Photo Timeline And More! SkyDrive was already a great application. Recent additional improvements have made it even better. The major change that was recently added is Photo Timeline. Like me, you may have your photos saved in descriptive folders. However, unless you look at the picture properties, it wasn't easy to locate pictures by date. Problem solved with the new Sky Drive Photo Timeline! Viewing the pictures I have saved to SkyDrive, I was surprised to discover that I have pictures from ten (and more) years ago saved. The example below is of a close friend's cats. Sadly, they have since crossed Rainbow Bridge but aren't forgotten and my friend now has two other cats. Photo Timeline isn't the only change to SkyDrive. According to internal Microsoft tests, changes to both the Desktop SkyDrive app and the server code have resulted in an improvement in upload times for photos by two or three-fold! Another nice addition is thumbnail view for your Word documents and PowerPoint presentations. To change to thumbnail view, just click on the icon in the upper right corner. Finally, full resolution uploads of photos and videos wherever Windows Phone 8 is now available. 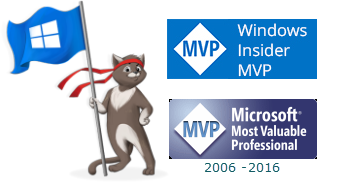 See more details and image examples in the SkyDrive blog article linked below. As a SkyDrive Insider, I am excited to share information about SkyDrive. If you have a question about this post, please leave a comment and I'll do my best to assist. Learn more about the SkyDrive Insiders program here. Microsoft released ten (10) bulletins. Two bulletins are identified as Critical with eight bulletins rated Important. The bulletins address 33 vulnerabilities in Internet Explorer, Microsoft Windows, Microsoft Office, Server and Tools, and .NET Framework. MS13-038 addresses the issues in Security Advisory 2847140. Users of Windows XP are reminded that support ends for Windows XP on April 8, 2014. See Tim Rains article, The Countdown Begins: Support for Windows XP Ends on April 8, 2014. *If you have had problems with .NET Framework updates in the past, it is advised that you install MS13-040 separately including a shutdown/restart. Adobe has released security updates for Adobe Flash Player for Windows, Macintosh and Linux. These updates address vulnerabilities that could cause a crash and potentially allow an attacker to take control of the affected system. With today's Windows Update, Internet Explorer 10 in Windows 8 and Windows RT is also updated. Warning: Although Adobe suggests downloading the update from the Adobe Flash Player Download Center, that link includes a pre-checked option to install Google Drive. It is recommended that you either use the auto-update mechanism within the product when prompted, or my preference, the direct download links. Flash Player for Internet Explorer 10: Microsoft updated Security Advisory 2755801. If you do not have Automatic Updates enabled, the Flash Player update can be downloaded from the Download Center at Update for Internet Explorer Flash Player for Windows 8 Release Preview (KB2758994). Adobe has released security updates for Adobe Reader and Acrobat XI (11.0.02) and earlier versions for Windows and Macintosh, and Adobe Reader 9.5.4 and earlier 9.x versions for Linux. These updates address vulnerabilities that could cause a crash and potentially allow an attacker to take control of the affected system. Because the vulnerabilities are being exploited in the wild in targeted attacks, it is recommended that users of Adobe Reader and Acrobat apply the update as soon as possible. These updates address critical vulnerabilities could cause the application to crash and potentially allow an attacker to take control of the affected system. Update checks can be manually activated by choosing Help > Check for Updates. Adobe Reader XI (11.0.03) for Windows is available here: http://www.adobe.com/support/downloads/product.jsp?product=10&platform=Windows. Adobe Reader XI (11.0.03) for Macintosh is available here: http://www.adobe.com/support/downloads/product.jsp?product=10&platform=Macintosh. Adobe Reader 9.5.5. for Linux is available here: ftp://ftp.adobe.com/pub/adobe/reader/unix/9.x/. Due to frequent vulnerabilities, it is recommended that Windows users of Adobe Reader and Acrobat ensure that Protected View is enabled. Neither the Protected Mode or Protected View option is available for Macintosh users. Click Edit > Preferences > Security (Enhanced) menu. Change the "Off" setting to "All Files". 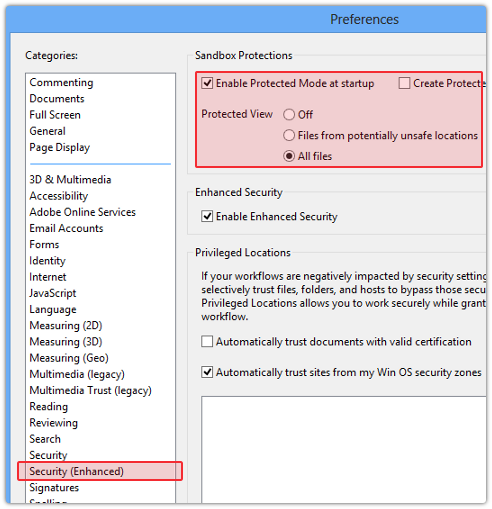 Ensure the "Enable Enhanced Security" box is checked. If you are looking for a replacement for Adobe Reader, consider Replacing Adobe Reader with Sumatra PDF. Mozilla sent Firefox Version 21.0 to the release channel. The current update information does not indicate that security updates are included. Update: The security updates were posted after this was published. The update includes eight (8) security updates, in which three are critical, four high and one moderate. The security updates are listed below. To get the update now, select "Help" from the Firefox menu at the upper left of the browser window, then pick "About Firefox." Mac users need to select "About Firefox" from the Firefox menu. If you do not use the English language version, Fully Localized Versions are available for download. 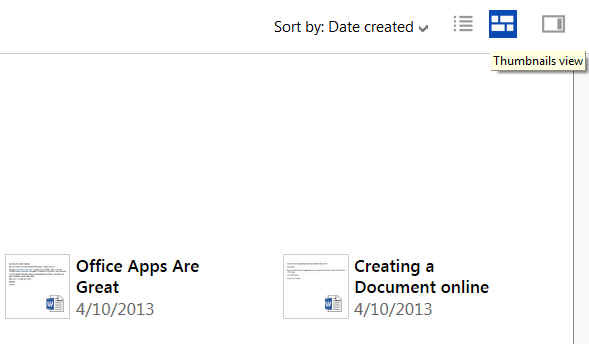 On Tuesday, May 14, 2013, Microsoft is planning to release ten (10) bulletins. Two bulletins are identified as Critical with eight bulletins rated Important. The critical bulletins will address vulnerabilities in Microsoft Windows and Internet Explorer. The bulletins rated Important and will address issues in Microsoft Windows, Microsoft Office, Server and Tools, and .NET Framework. Microsoft is also working to have the Internet Explorer Security Update address the issue for Internet Explorer 8 as described in Security Advisory 2847140. This anticipated update will supplement the Fix it solution as detailed yesterday here: Microsoft FixIt for Security Advisory 2847140. As happens each month, Microsoft will also release an updated version of the Microsoft Windows Malicious Software Removal Tool on Windows Update, Microsoft Update, Windows Server Update Services, and the Download Center. Microsoft released a Microsoft Fix it solution for Security Advisory 2847140, which relates to a vulnerability for IE8. Although it is anticipated that there will be an update included with next week's security updates, anyone with IE8 installed is advised to install the Fix it solution. The Fix it uses the Windows application compatibility toolkit to make a small change at runtime to mshtml.dll every time IE is loaded. Another option is to install the Enhanced Mitigation Experience Toolkit (EMET), described in the "workarounds" section of the Tech Net Advisory. If you have Windows Vista or Windows 7 installed, you should have updated to IE9 or IE10. In the event you haven't, it is strongly advised that you update!